Some services are delivered in Mijas Pueblo in ways that are interesting to me. As a child I recall bread and milk being delivered to our house so it really should have been no surprise to see home delivery of some services in the village. Bakeries have contracts to deliver fresh rolls and bread to restaurants and some individuals. I am uncertain how early these deliveries occur but I have at times gone walking before 7:00am and have seen bread hanging on doors as pictured here. 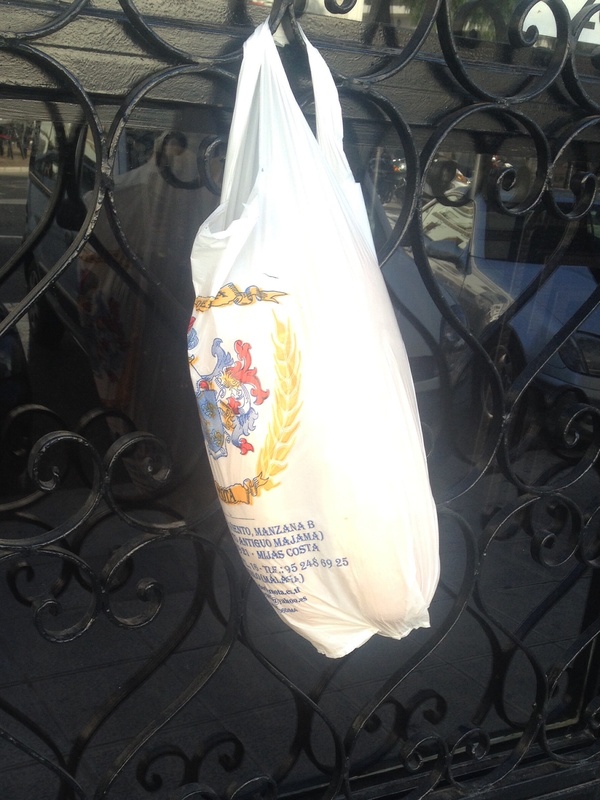 This photo was taken at a house so can you imagine a large plastic bag of rolls and bread delivered to a restaurant also hanging on the door? Fresh bread is really important in this Spanish community. Another experience I have had is the reason for the title of this blog entry. You see, the homes and businesses use butane to provide heat for cooking, hot water, and to warm the house. It is delivered in orange canisters that are similar to propane tanks in the US. One enterprise goes through town in a truck filled with butane canisters and residents come out to exchange empty tanks for full ones. The residents know he is there because he has wired his truck horn to loudly blast the tune La Cucaracha! It is just a unique way for the villagers to know that if they need butane to get it then! That’s today’s blog entry. If there are topics you would like me to describe or reflect on during my adventure in Spain, please let me know. Next Next post: Traffic Jam and Optimism in Mijas!